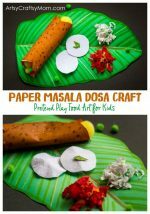 Kids can’t say no to pasta, even when it’s made of paper! Our Spaghetti and Meatballs Craft for Kids is super easy and looks better than the real thing! I am yet to see a kid who doesn’t like spaghetti or noodles. There’s something so satisfying about slurping those smooth strands, along with thick sauce and something with a good bite! Many adults also find this dish extremely comforting – forget the calories! 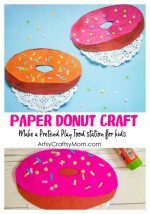 We’ve converted this kid favorite into a fun craft that’s perfect for pretend play! 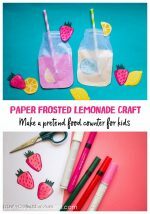 This craft is super easy, and you can make this with basic craft supplies and stuff around the house. 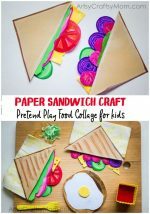 If you’ve tried our paper pie craft, paper sushi craft or our paper sandwich craft, then this one will be a piece of cake……sorry, meatballs!!! 1. Let’s begin boiling our pasta, or in this case, cutting it out! Cut out thin long strips from yellow felt. Try to keep the strips uniform, so the spaghetti looks neat. 2. Once you have enough strips to fill your plate, let’s get started on the meatballs. Cut out equal sized strips from aluminium foil, about an inch or inch and a half wide. 3. Now scrunch up each strip to make a rough sphere. Use a light hand; pressing too hard will end up in a smooth shiny ball – certainly not how meatballs look like! 4. Paint the aluminium balls maroon. You might have to apply multiple coats to get into all the grooves and cover up missing spots. Leave them to dry completely. 5. Our main ingredients are ready, not it’s time for finishing touches! 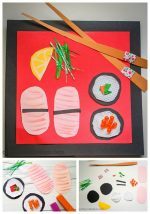 Cut out circles from the red paper and use a marker to turn it into tomato slices. Cut up green paper into tiny bits for the garnish. Tear out a piece of green tissue paper to make lettuce. 6. Time to plate up our special dish! Arrange the yellow spaghetti to cover the paper plate. Embed the meatballs between the yellow strips. Place the lettuce and tomato slices and sprinkle the green paper bits. Add a plastic fork and spoon and your spaghetti and meatballs dish is ready! After trying out this Spaghetti and Meatballs craft, don’t be surprised if the kids appear super interested in helping out in the kitchen to make their own edible meatballs! 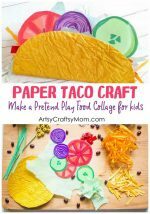 Pretend play food isn’t just good for playing chef, it’s also a great way to get kids more involved in the food preparing process. Learning about ingredients and cooking techniques will encourage healthy eating habits – not to mention a renewed appreciation for the person who does the cooking every day!